This Adult Scooby Doo Velma Costume will have you using your smarts to save the day! 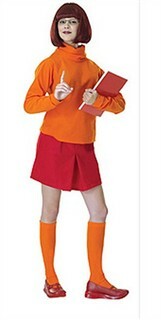 This groovy Scooby Doo costume looks just like the orange shirt and red skirt worn by the brainy character. Also included is a Velma wig, styled after her familiar bob, and a set of glasses. Jinkies! This is the smartest choice for your Scooby Doo group Halloween costume This Adult Velma Costume comes in a standard adult size that fits most. Availability: This Velma Costume takes approximately 1 business day to leave the warehouse. Please not: costumes with wigs are not returnable.